Our new video explains the multiple problems our research found with conditionality in Universal Credit. 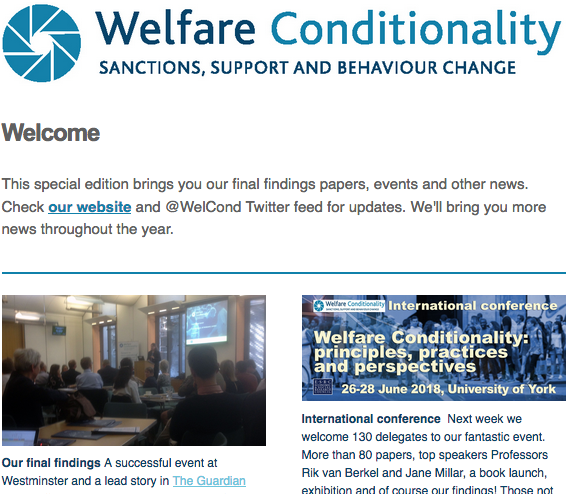 Negative impacts and counterproductive effects of sanctions were widespread, and for those already in work conditionality simply did not make sense. Our project’s UC lead researcher Dr Sharon Wright from the University of Glasgow explains. Read our findings in full here. Sanctions fail to encourage people to engage with the social security system in a meaningful way, leading to negative effects. That’s a key point from a new video by our lead researcher on offenders, Professor Del Roy Fletcher from the Centre for Regional, Economic and Social Research at Sheffield Hallam University. Professor Fletcher outlines the way many offenders end up claiming the wrong benefit, and so experiencing high levels of sanctioning. He points to the crucial difference getting support to deal with problems makes in helping bring about sustained behaviour change among this group of welfare service users. Read our findings in full. Our researchers from the University of Glasgow have called for greater social security powers to be devolved to Scotland to end the punitive UK sanction regime. In Scotland, newly devolved social security legislation is based on the principles of ‘dignity, fairness and respect’, with employment services being needs based and voluntary without sanctions. However, the findings of our new report launched today show that, with many social security powers still reserved to Westminster, it means an ineffective UK system of conditionality and sanctions is causing profound suffering to people in Scotland. Our new short video featuring Dr Sharon Wright from the University of Glasgow explains the gender dimension in Universal Credit and other welfare benefits illuminated through our research. And lone parents also face barriers in the welfare system. Professor Sarah Johnsen from Heriot-Watt University explains how benefit sanctions undermine lone parents’ efforts to find work – and what needs to change.